On Sentient Universes, The Problem Of Evil, Grant Morrison, Doctor Who and other such stuff | Sci-Ence! Justice Leak! Blame Philip Sandifer for this. I meant to write another short story today (I still might). It’s just a blog post, but not because I don’t have enough to say on this subject, but because I can’t justify writing a *third* book that’s mostly about Morrison’s ideas. The root idea is, for once, borrowed from Grant Morrison instead of Alan Moore. Morrison has several times suggested that the DC Universe line of superheroes is sentient and has an animating consciousness. My disagreement with Morrison is not on this point, but rather on the implications of it – Morrison seems rather to like this fact, whereas I think that the DC Universe is, while sentient, a dangerous sociopath (albeit one capable of moments of staggering beauty). But the underlying idea, obviously, appeals. I think Sandifer may be reading Morrison a little too simplistically here (odd, because his reading of Final Crisis as narrative collapse is absolutely correct). And it will surprise no-one who’s read… well, anything I’ve ever written… that I’m going to use Seven Soldiers as a counter-example. Before I start talking about this though, I just want to say that the idea of a fictional universe being sentient is, while far-fetched, not one that should be entirely dismissed out of hand. Certainly, if one is to make the assumption that neural networks embody intelligence (an assumption made by many, with little or no reason that I can see — the argument appears to be ‘the neurons are the bit of the brain where we can tell some of what they’re doing, so therefore they must be the important bit, not all those glial cells and such’. I exaggerate slightly.) then the collaboration network of Marvel Universe characters has some very interesting features. This is not to say I agree with Morrison or Sandifer — I don’t — but that their contentions are not utterly dismissible, and are at least an interesting way to look at things. 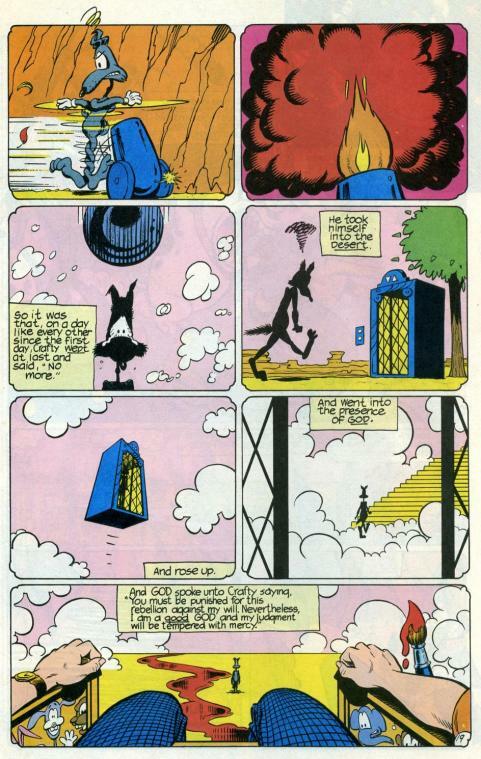 The DC Universe, and Doctor Who, are not sentient themselves, but treating them as sentient entities can provide interesting readings. So — *does* Morrison seem to think that the sentient DC Universe is an ultimately benevolent one? Borrowing some of the structure from Michael Maltese’s script for Duck Amuck (and incidentally, does anyone else get as annoyed at the attribution of authorship of classic cartoons to their director as I do? Chuck Jones was great, but Maltese scripted and storyboarded those great cartoons), Morrison (and Truog, Hazlewood, etc, but here and from here on I’m talking specifically about the writing) creates a strictly hierarchical set of fictional universes. The Looney Tunes/Merrie Melodies universe is lower than the DC Universe is lower than ours, and in each of these, there is a creator who delights in causing pain to the more innocent people in the universe below. Fitz took his last drag on his cigarette and ground it out on the window sill. Fitz laughed and looked at the moon. ‘Oh, yes,’ said Canine primly. In fact, Morrison’s later take on the relative positions of the various universes seems closer to Lawrence Miles’ use of bottle universes in his Doctor Who fiction. In Miles’ New Adventure Christmas On A Rational Planet the Seventh Doctor sees the Eighth Doctor living in a bottled universe, but in his BBC Book Interference he has the Eighth Doctor looking into a bottle universe containing the New Adventures version of the Seventh Doctor. (And in Dead Romance a universe very like our own is revealed to be inside another bottle). This is a far more nuanced idea of creator and creation than the one in Animal Man. At first sight, the hierarchies have been reversed – Siegel and Shuster’s universe, here, is the one inside the DC Universe. Except that this is absolutely the moment of creation of the DC Universe – the first ever drawing of Superman. And that creation is inspired by the influence of Superman from outside. This is more like a resonance between two universes than a straightforward hierarchy. But it still seems to confirm Sandifer’s reading – Superman is, in All-Star Superman, pretty much goodness and decency personified, while we are fallen, helpless creatures who need raising up. But why did we fall? For that we must look to JLA: Classified. That’s the infant universe all grown up, as Ne-Bul-Oh The Huntsman. The seed of evil he’s talking about there is an infiltration into our universe from the DC Universe by a supervillain. I’ve argued at ludicrous length (40,000 words of it!) that when Ne-Bul-Oh refers to ‘fruit’ here, there’s a deliberate reference to the tree in the Garden of Eden. The DC Universe, in other words, is responsible for original sin. And time and again in Morrison’s recent work, we see this – the two universes influencing each other, both for good and evil. Ne-Bul-Oh is evil, but only because of the DC Universe – but the people of the DC Universe enter our universe in order to prevent this. When the people of our universe look for inspiration, for heroes, we turn to Superman and Batman (Morrison has admitted that when he was writing JLA in the 1990s, at a time his life was collapsing around him, he was doing it at least partly as a magical working – crying out to Superman and Batman to save him). But when Zatanna is suffering, what happens? She reaches out to us, the readers. Reaches out even though this story is the one where our universe is inside theirs, and is responsible for the attacks she’s fighting. I think a close reading of Morrison’s DC Universe work, then, shows that he thinks the DC Universe could have either a good or a pernicious influence on this one – could be great or could be sociopathic – just as this universe could have a similar influence on the DC Universe. The two can either help pull each other up or drag each other down, and it’s up to us, the readers and writers and artists – the individuals – to decide which it’s going to be. I agree with Sandifer that if we were to look at the output of DC Comics at the moment, or really at any time since about 2003, it would appear sociopathic. Where I disagree is that I think Morrison knows that, and that he’s working consciously to change that. This entry was posted in books, comics, Doctor Who and tagged all-star superman, animal man, Doctor Who, Grant Morrison, lance parkin, lawrence miles, multiverses, qwewq, seven soldiers, tardis eruditorum. Bookmark the permalink. This is perhaps obvious for any long-time Morrison reader, but the pairing of the two universes you describe here is the same as the pairing of the dual forces in Invisibles. Still worth pointing out – I thought of mentioning it, but it’s been many years since I last re-read The Invisibles (I have a more complicated relationship with that than with many of Morrison’s other works – I love bits of it but there are bits about it I strongly dislike) and thought I might get something wrong. The interdependence is the core of it, really — the face which the Invisibles present to the Outer Church affects the face which the Outer Church presents, and vice versa. The interesting difference is probably that in Morrison’s later work, he’s got the universes reaching out for help as opposed to reaching out in opposition. But that seems to me to be an evolution of the concept rather than a fundamental change. Morrison deliberately trying to change the DCU is fascinating, given his identification with King Mob and King Mob’s work to change the Outer Church in the final volume. I think the thing I like most about this is that you can follow this highly twisted, seemingly weird path to that conclusion. Fiction suits and so on. But then you take a step back and go, wait, of course: the author affects the universe, and fiction affects us, and how is that so unusual in the end? Don’t have much to add to that other than that you are, of course correct. And thank *you* for reading. I would lay one simple fact against the textual evidence, however – Morrison makes his living in the DCU and has, in Supergods, publicly defended the mistreatment of creators that makes the DCU possible in the first place. I view Morrison’s relation with the DCU as the sort of thing that exasperated anti-capitalists complain about when they point out that every mainstream political option is just different flavors of late capitalism – would you like your capitalism with or without universal health care, for instance. Yes, Morrison critiques some of the problems of the DCU, but in the end Morrison works completely within it and its fundamental structures and ideas. Which is really just a restatement of my basic view of Morrison in comparison with Alan Moore – in the end, I find Morrison hollow because I think his only real ambition is to be a rock star. So long as the system allows for his own self-fetishization I think he’s largely unconcerned with its other effects. When he goes off on his “what if the system is our playground” bits in Pop Magic, I think what he’s really saying is “look at me, I got rich playing with Batman.” And I think he mistakes his personal liberation as a more or less unedited rock star comic book writer with rich Hollywood friends as a general state of freedom for the world. Oh no — today was ‘great’ rather than ‘infuriating’, and you’re confusing me with my friend Richard (who did indeed stop reading your blog after that post — I left that argument well alone). Having read Supergods only once, when it came out (my assessment – third best book about Grant Morrison to come out last year, after Marc Singer’s and mine), I may be misremembering, but I don’t think he defended DC’s business practice as much as engage in a mealy-mouthed “well, maybe it was like this and maybe that, it was all a long time ago mumble mumble shuffle feet”. True – but of course those sorts of quibbles are a lot easier to make for the people *with* health care than for those without. I do think Morrison’s stance on DC’s historic (and in some cases ongoing) mistreatment of its creators is cowardly, but it’s a moral cowardice that almost everyone with a job engages in (I won’t even *name* my own employer on this blog, for example). I’m not going to criticise Morrison for refusing to publicly attack his employers, though I think Moore’s moral courage is ultimately more admirable. I disagree, though, that Morrison’s only ambition is to be a rock star. I certainly think he’s less interested in the political effects of his actions than someone like Moore or (to take an example of people whose principles I utterly disagree with but who nonetheless act on them) Ditko or Dave Sim, but he’s not just playing with surfaces either. Rather I think he’s someone who’s seen his father worn down from fighting the system, and die having lost (his father was a Libertarian Communist) and decided that we can’t change the system without changing human nature (just as his father’s intellectual generation would have argued we can’t change human nature without first changing the system). I think that’s a shallower position than the other possible ones, but I can see why he would take it as much out of self-defence as self-aggrandisement. I have no idea why all the random spaces are in that comment. I didn’t put them there. Beg to differ on one point. 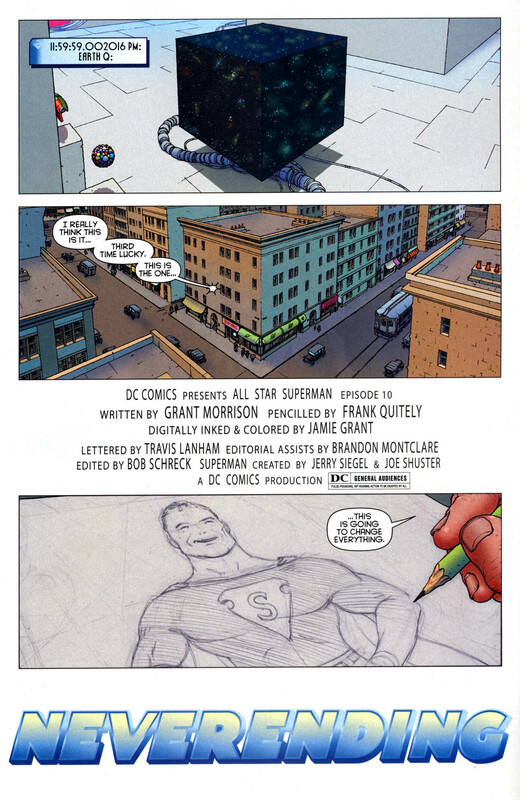 Morrison did not just refuse to publicly attack his employers — he actively defended them and belittled the two men he purported to honor in that page from All-Star Superman #10. It wasn’t an act of cowardice like “If I speak up I’ll lose my job” but rather “by elevating my employer and disparaging the guys they repeatedly screwed, I can justify the self-interested ethical choices I’ve made in supporting my bosses.” You know where I used to stand on Morrison’s work, so you understand how great a betrayal I consider this. Could you point me to a section (page number or quote) where he does this? I certainly don’t remember him actually belittling Siegel & Shuster as such, but that doesn’t mean you’re wrong here. If you listen to the right voices, you’ll hear and believe what I heard and believed growing up in this business, and it won’t be long before a dark and evil fairy take unfolds: the grim cautionary fable of two innocent seventeen-year-old boys seduced by the forked tongues of cartoon fat-cat capitalists and top-hatted bloodsuckers. In this Hollywood tragedy, Jerry Siegel and Joe Shuster are depicted as doe-eyed ingenues in a world of razor-toothed predators. The truth, as ever, is less dramatic. The deal was done in 1938, before Superman boomed. Siegel and Shuster were both twenty-three when they sold the copyright to Superman. They had worked together for several years in the cutthroat world of pulp-periodical publishing, and, like so many artists, musicians and entertainers, they were creating a product to sell. Superman was a foot in the door, a potential break that might put them in demand as big-time pop content providers. Superman was a sacrifice to the gods of commercial success. If my own understanding of the creative mind carries any weight, I’d suspect that both Siegel and Shuster imagined they’d create other, better characters. But in 1946, they realised how much money their creation was raking in. They sued National, unsuccessfully, and then tried to repeat Superman’s success with the unendearing, short-lived Funnyman (a crime-fighting clown). Siegel was also responsible for the gruesomely vindictive avenging superghost the Spectre and cyborg hero Robotman. He would even write that quintessential British superhero strip The Spider, but the relative obscurity of those perfectly well-conceived characters tells its own story. Jerry Siegel failed to create any more features with the primal impact of Superman, but he and Joe Shuster had done something spectacular – established the rules and foundations upon which new universes could be built. Now, that is certainly a lot of mealy-mouthed dancing around without ever daring to express an opinion, and it does rather give the impression that there are two sides to the story (while personally I have to say that the ‘top-hatted bloodsuckers’ bit is about right), but he doesn’t actually defend DC as such and *definitely* doesn’t belittle either Siegel or Shuster. I don’t like that section of the book, but nor do I consider it morally indefensible. “I try not to concern myself with that” sounds mild, but when you consider what disdain Time Warner lawyers were directing at Jerry Siegel’s widow and daughter, it starts to seem painfully callous. If I was to play devil’s advocate over Seigel and Shuster I’d argue they really just got the ball rolling. Better Superman stories, and even what we now think of as quite integral elements of his mythos, came after them. It’s not really the same situation as Kirby on the Fantastic Four or something. Not that I think that justifies DC’s treatment of them, admittedly, but it puts a slightly different spin on it. I’m not sure where Morrison’s father stood either – I think, from what I’ve read, that he was more interested in pratical politics than in theory, and he may not have had a coherent position at all. As for S&S, well, a lot of the mythos came after *Shuster*, but Siegel wrote a lot of the Weisinger-era stories during his second stint on the character. Of course, with the Weisinger stuff, it’s impossible to tell who came up with what idea, but between him being sole/main writer for the first ten years and the main writer from 1958-67, he did pretty much create everything we think of as Superman except for Jimmy Olsen and Kryptonite. I don’t think there are “better” Superman stories, is what I’m saying, and I’m not trying to pounce on you Gavin (definitely not!) but you just reminded me of it, crystallized it a bit for me…people do believe there are, but only because they believe there can be, and the only reason they believe that is that they’re being encouraged to believe it. The idea of a Superman “mythos”, too, is just another (connected) way of establishing/enforcing the primacy of Good Story Progress, the idea that DC exercises stewardship of Superman, that you could then call wise or unwise…well, but Superman is not a seedbank or a UNESCO site, he’s just a character who wears a blue suit, and the wise/unwise thing doesn’t come into it! Well, the “stewardship” thing clashes with the “anything for a good story” thing anyway…because both are deceitful rephrasings, in “creative” terms, of essentially business-oriented ideas: DC has an investment in Superman, not culturally but financially…and “anything for a good story” is really code for “anything for a buck”. Ha, and in the business-phrasing, these two don’t conflict! But in the “creative” phrasing they totally do. Sorry, I don’t mean to rant and rave, but I was just suddenly reminded of it: as a reader and comics fan, I don’t believe in Superman as a phenomenon, as “Superman-ness”. There’s a corpus of stories about a character called Superman, and that’s it: the corpus can be added to, but it can never be perfected, so “better Superman stories” must be a lie? No ball, and no rolling thereof, except in terms of return on investment for the property-owner…Bill Griffiths nailed this all back in the early Eighties, ranting about how moviegoers had started to use agent-speak with one another, the language of the insider in the world of biz…obviously we know comics fans do it too. I only wish I could free myself from doing it, but I cannot quite get all the way free, so I’m always a little bit entrained by the purposes of other people…”supporting books I like”, and all that stuff, etc. etc., world without end. Oh, and Siegel invented “K-Metal”, right? So it’s really just Jimmy Olsen. Thread-jacker! I do apologize. All I can say is that the spirit moved me. “The Ancestor Cell” gets just about everything wrong, but serendipitously one thing that I think they get wrong in exactly the right way relates to the bottles – they start calling it a Klein Bottle. I suspect that they do that because they think it sounds cool or that they vaguely know what one is and think it looks cool. But, informally, a Klein bottle is a bottle that is inside itself. Anyway, what you’re getting at here is that our universe and the DC universe are inside each other like a Klein torus or something. Yeah, I thought of using that metaphor, without realising/remembering it had already been in That Book. Probably a good thing I didn’t reference it, though – I’m sure referencing The Ancestor Cell in the same post as Miles’ work would cause some sort of matter/anti-matter annihilation effect and bring about the end of the world. There’s a klein bottle vase in The Death of Art. Just thought I’d mention that. So there is – I’d forgotten that. And coincidentally that one came right after Cold Fusion, the book that started this discussion, didn’t it? Always liked what you did with the Shadow Directory in that one. They might be a bit simplistic and doesn’t account for our universe but I was so disappointed with some of “52” (which I know Grant was only a collaborator on), particularly how the repeated mention of “52” didn’t amount to anything and the resolution/capture of Mr. Mind in a paradox that might have been fine in the ’50s but was more than hackneyed then. When I heard about Morrison’s idea of the DC universe being sentient and that, among other things, was heroes came back from the dead I thought it could be attributed to the original Crisis ending in one universe. Before that its consciousness was fractured and when it became whole/singular it was so grateful for this and aware of the heroes part in this happening that it finds ways to bring them back from the dead. Then, when the universe is split again in “Infinite Crisis” it goes insane. That would be why “52” would show up so much in that “52.” How this would be resolved is beyond me, a cosmic-lobotomy seeing a bit much, but I assume someone could have figured out a way to integrate the now split-personality universe.